India is a country with diverse culture. What strings together most part of India is agriculture. It not only forms an essential part of Indian economy but also yields one of the world’s best wheat, fruits and veggies. Organic farming has been in India for long. Heard of Bamboo drip irrigation? It is a unique technique to consistently water betel leaf trees in Northeast India. Agriculture in India has undergone a sea change with an indispensable role of technology and scientific methods of farming. Don’t be surprised if you get to know the fresh crunchy Lettuce and Jalapenos served inside a burger at an international fast food chain in India, is homegrown. Vertical Farming is one such change that has just begun taking root in India. Vertical farming is a simple and yet a smart concept that optimises the photosynthesis of a plant with effective technique. 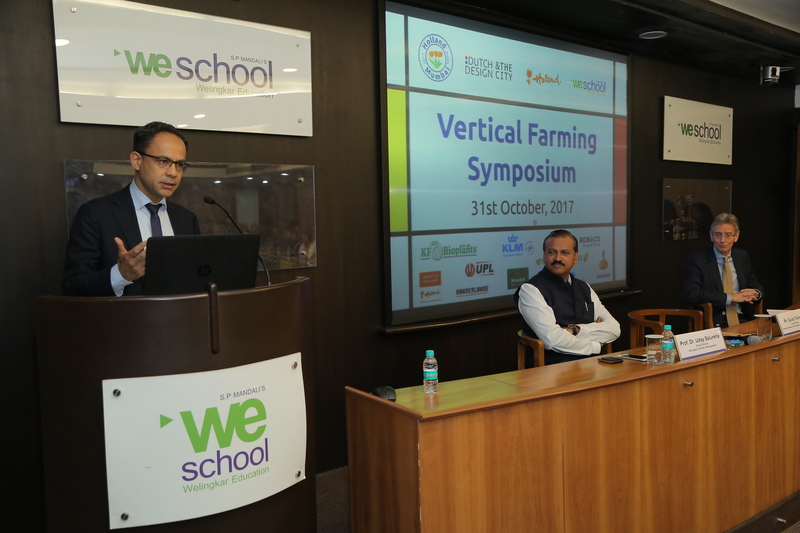 Putting thoughts together and sharing ground reality on Vertical Farming was a symposium held at WeSchool, Mumbai Campus recently. The symposium aimed to create awareness on the concept of vertical farming, application of different farming techniques and progressive results of vertical farming in other developed economies. The event was attended by noted companies in AgriBusiness and vertical farming. The event was jointly organised by S.P. Mandali’s Prin. L. N. Welingkar Institute of Management Development & Research (WeSchool) in collaboration with the Consulate General of the Kingdom of the Netherlands. The symposium witnessed notable speakers such as Mr. Guido Tielman, Consul General, Consulate General of the Kingdom of the Netherlands; Mr. Wouter Verhey, Agriculture Counsellor, Embassy of the Kingdom of the Netherlands; Mr. Sritanu Chatterjee, Agri-Business & Trade Officer, Consulate General of the Kingdom of the Netherlands in Mumbai; Mr. Peter van Dongen, Chairman, Executive Board, Van Hall Larenstein University of Applied Sciences, The Netherlands; Mr. Niek Botden, CEO, Holland Door Cooperative U.A. ; Mr. H. P. Doddamani, Chain Manager, Sales, Rijk Zwaan India Seeds Pvt Ltd and Mr. Sanjay Sudan, Director, Saveer Biotech Limited. Addressing the participants, Mr. Peter van Dongen, Chairman, Executive Board, Van Hall Larenstein University, the Netherlands mentioned the need to co-create a future with the sustainable solution of vertical farming. He expressed that various Indian partnerships and an existing partnership with WeSchool and ADT Baramati, will bolster experiential learning in agri-business sector. The discussions brought to light vertical farming concepts that make the idea sustainable – it is a solution that fits within the umbrella of growing urban population. Secondly, it calls for the significance to have more green cover in the midst of gray concrete jungles thereby enhancing the quality of life of the urban dweller. In his presentation on ‘Feeding Indian expanding cities’ Niek Botden, CEO, Holland Door Cooperative U.A. , showcased how vertical farming facilities can be built anywhere and be used year-round. It uses less water and yields more per square meter than traditional farming, making it a viable alternative to traditional farming practices, he added. H P Doddamani, Chain Manager, Sales, Rijk Zwaan India Seeds Pvt Ltd highlighted how cropping practices for growing healthy vegetables can be augmented to feed the growing global population. His presentation on ’Plant factory’ was a wonderful pointer to futuristic farming practices. Sanjay Sudan, Director, Saveer Biotech Limited focused more on the Greenhouse infrastructures and ‘Hydroponic’ technology which can help grow vegetables like cucumber, lettuce, tomato and capsicum in a controlled environment without using soil. The collective response to an open discussion on vertical farming brought to awareness that progressive companies in India and the Netherlands express an interest in vertical farming as a green practice for fresh produce. The symposium took a refreshing look at how vertical farming as a smart concept answers the future challenge of food production. With expanding population and urbanisation, land for plantation is limited especially in urban cities. Vertical farming optimises limited resources of water and land to yield a pesticide-free fresh produce. Vertical farming needs to gradually evolve through impactful projects in city infrastructure thereby answering the future need of food demand and supply.